They struck early, struck hard, and made an offensive impression in State College. Buckeyes sweep the series with the Nittany Lions. 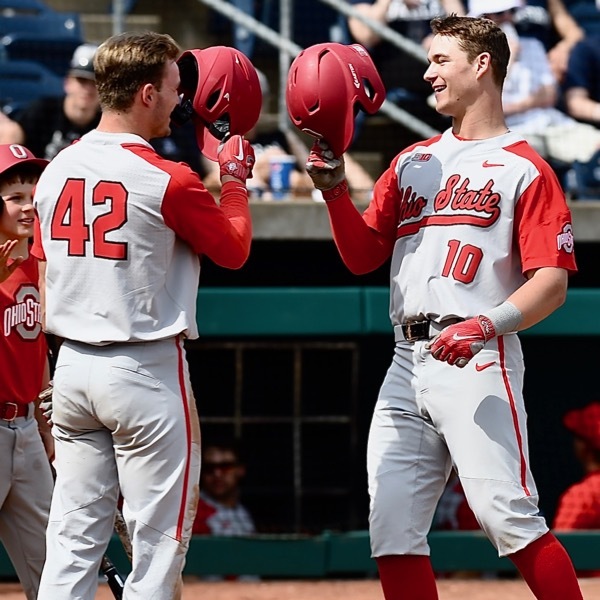 State College, PA – The ‘settling in’ of this baseball team took another step Saturday afternoon as the Ohio State Buckeyes (24-10, 6-3 in Big Ten) emphatically swept their weekend series with the Penn State Nittany Lions (7-22, 1-11 in Big Ten). In the first game they struck early, struck hard, and got a solid starting effort from junior Ryan Feltner and strong bullpen work for a 5-1 win. Feltner pitched the first six innings, surrendering five hits, struck out five, and walked three for his fourth win of the season against two losses. Freshman Griffan Smith came on to pitch the seventh and eighth, giving up Penn State’s only run in the eighth on a triple by Ryan Sloniger and an RBI single by Braxton Giavedoni. Co-captain Kyle Michalik got an inning of work in the bottom of the ninth, closing out the Lions in 1-2-3 fashion. The offense came on a single run in the third – catcher Jacob Barnwell singled to lead off and Penn State promptly played it into a ‘Little League’ home run with a couple of throwing errors that allowed Barnwell to circle the bases and score. But an inning later the Bucks put four on the board in a more impressive fashion. With one out designated hitter Brady Cherry lofted a majestic fly ball to left off Penn State starter Taylor Lehman that caught the jet stream blowing out toward the foul line. The ball cleared the wall for his second home run of the season. On the first pitch to the ensuing hitter, Dillon Dingler, Dingler hit one even farther, to left center, his third bomb of the year. Not done, Barnwell followed with a single, his second hit of the day, Noah West doubled him home, and then scored on dropped fly ball by left fielder Braxton Giavedoni. From that point on it was a matter of how far Feltner would go…and how well the bullpen would perform after his departure. 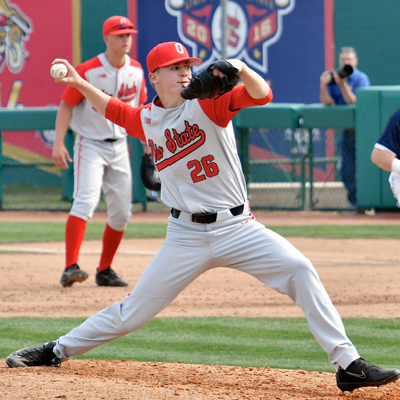 Ryan Feltner pitched six shutout innings in game one to record his fourth win of the season. 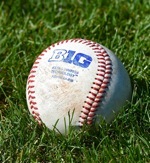 The Buckeyes won it on 5 runs on 10 hits and committed two errors. Dingler, Barnwell, and Noah West led the hit parade, each with two knocks for the game. Penn State lost it with 1 run on 7 hits and committed three errors. Catcher Ryan Sloniger and shortstop Logan Goodnight each had 2-hit games for the Nittany Lions. 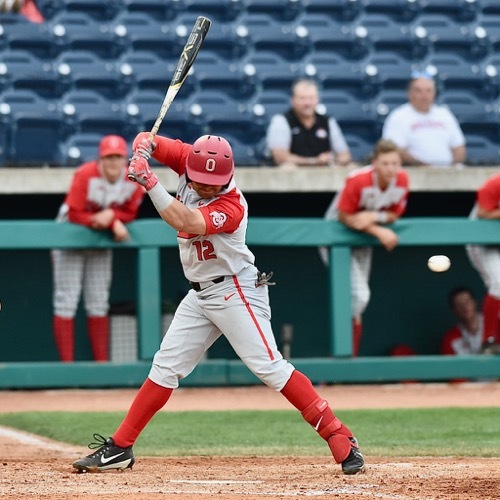 The second game…was a different matter, as the Buckeyes scored 19 runs on 16 hits, threatening to short-circuit the scoreboard, to post what turned out to be an emotional 19-8 win. 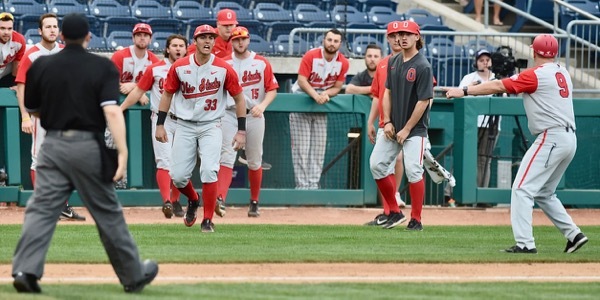 Ohio State jumped on Penn State starter Dante Biasi for four first-inning runs, highlighted by a two-run home run by Tyler Cowles, his fourth of the season. Penn State answered, scoring three of their own in the bottom of the second, including a three-run bomb to right field by first baseman Shea Sbranti off Buckeye starter Adam Niemeyer. Ohio State came right back, posted four more runs in the top of the third, the big knock a two-run double by Cowles, driving in his third and fourth runs of the game. Tyler Cowles recoils from the impact of being hit in the fourth inning of game 2. It resulted in the ejection of PSU pitcher Eric Mock. Penn State was hardly shaken, and came back in the bottom of the third to score a pair on three consecutive hits to start the inning, the third a two-run single by designated hitter Parker Hendershot. The score stood at Ohio State 8, Penn State 5 as the game moved to the fourth. More thunder, more lightning…as Dominic Canzone opened the fourth with a double to the right center gap, followed by a walk to Kobie Foppe from reliever Eric Mock, who replaced Biasi one out deep in the third. It brought first baseman Conner Pohl to the plate, who delivered a high, majestic shot to right field that landed in the elevated bleacher section of the stadium, and some thirty feet above the playing field. It was Pohl’s fifth home run of the year, it made the score 11-5, and it lit a fire under Eric Mock. He proceeded to throw four straight pitches to the succeeding hitter, Tyler Cowles…one high and outside, one high and tight, one behind him, and the fourth plunked Cowles in the small of the back. Mock was immediately ejected by plate umpire Tom Honec and the Ohio State bench flooded onto the field. But calm was quickly restored by the umpires and coaches Greg Beals and Rob Cooper. However, reliever Mason Mellott, who relieved the ejected Mock, hit the ensuing batter, Brady Cherry, with the second pitch he threw. 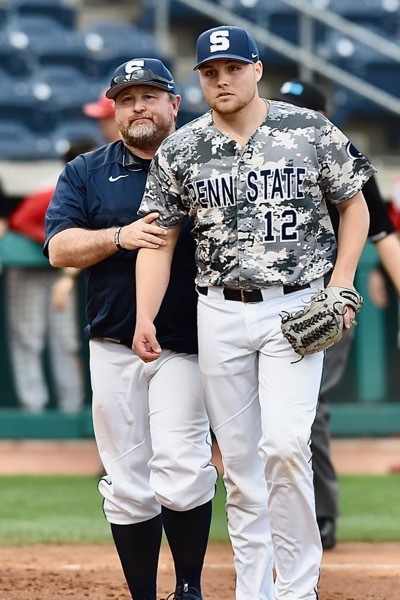 Penn State Rob Cooper escorts pitcher Eric Mock from the field after his fourth inning ejection. Ohio State came back to score a single run in the top of the fifth on a Foppe sacrifice to left, scoring Noah West who had walked to open the inning. They added two more in the top of the seventh…on an RBI double by Canzone and a wild pitch. In the eighth they loaded the bases again and scored one run on an infield hit by Malik Jones, Noah West was hit by a pitch to force in the 16th run, and Dom Canzone drove in run number 17 with a sac fly to left. 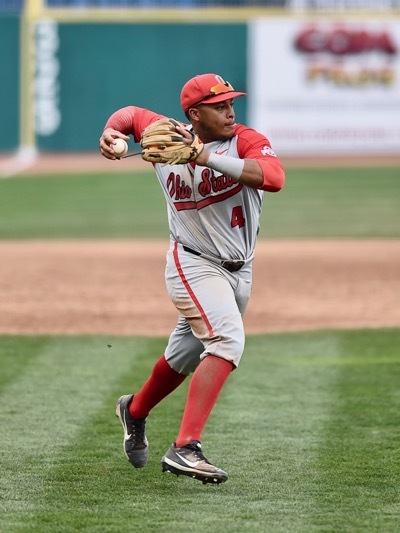 Penn State added another run in the bottom of the eighth off Yianni Pavlopoulos, the Buckeyes’ third pitcher of the game; Ohio State added to their lead in the top of the ninth on an RBI single by Malik Jones, scoring Noah McGowan with the 18th run. Noah West walked to force in Dillon Dingler with the 19th run. Pitching? Adam Niemeyer gave up 5 runs on 9 hits over five innings to gain the win, his third of the year. Austin Woodby entered in the sixth to pitch two scoreless innings. Pavlopolous worked a one-run eight, and Curtiss Irving closed things in the bottom of the ninth, giving up the 7th, and mercifully, the 8th and last run of the game. To term it best…it was a practice in survivalism. It was wild…runs, and hits, hit batsmen, and the emotional response of having your manhood – and brotherhood – challenged with the dustup in the fourth inning. It was long…in all, over six hours of baseball. The second game alone was clocked at 3:33 minutes, and that’s probably conservative. But it was the kind of ‘tough’ challenge that was necessary, if not unexpected, with the opportunity for a weekend sweep on the road at hand. Asked afterwards if he’d ever won a tougher double-header, given the length of day, the hits, runs, and extra-curriculars, Greg Beals left no doubt that he was pleased. Third baseman Noah McGowan provided a diamond gem to throw out a Penn State hitter on a bunt attempt in the fifth. “Well, it’s hard sometimes to calculate tough,” he said with a satisfied smile. “But no doubt about it I think it was critical for us not to think we could just throw our hats out there and go through the motions. I challenged them after the first game…that we had won the series, but it was important to sweep the series. I wanted to fire the boys up and let them know we had a great opportunity in front of us and we answered the bell. As to the obvious hitting of Cowles in the fourth, and subsequent ejection of Eric Mock, Beals took it in stride, but served notice that he approved of how it was handled. 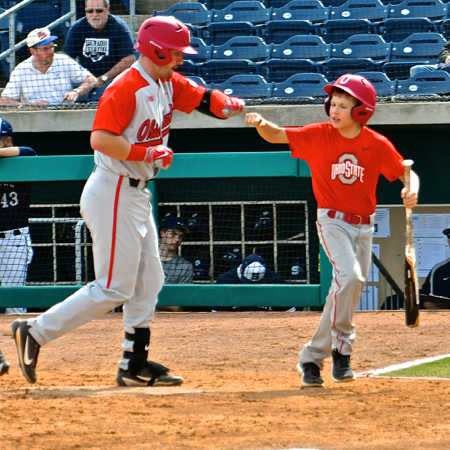 Buckeye bat boy Brady Spears had the busiest day of all…keeping up with 24 runs and 36 hits. Brady is the son of Buckeye broadcaster, Bob Spears. Without question the ‘extra-curriculars’ detracted from an otherwise impressive offensive outburst – a dizzying menagerie of numbers. Dillon Dinger went 5 for 9 in the double-header. Noah West went 3 for 7. Tyler Cowles went 2 for 3 in the second game, with a home run and 4 RBIs. Jacob Barnwell was 3 for 7 on the day. Noah McGowan was 3 for 8 on the day. Brady Cherry was 2 for 7 with a home run. Conner Pohl had the fourth inning home run in the second game, with 3 RBIs. In all…24 runs and 36 hits in eighteen innings of baseball. But the most satisfying part was that business of taking care of business when a great opportunity was at hand – the character to keep themselves intact and keep playing baseball despite emotions and distractions. Winning in different ways, and winning on the road. A bit of ‘Little League’, a Cherry bomb, a Dingler ‘Dinger’, and a ‘Pohl’ to right. And God bless the charter jet. After all that baseball – six hours worth – it only took 50 minutes to get home, the shortest part of the day. Here they come…Dominic Canzone leads the way as the dugout emptied to support Tyler Cowles after he was hit in the fourth inning of the second game.